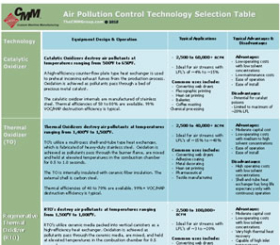 Thermal Recuperative Oxidizers (TO’s) from The CMM Group destroy air pollutants emitted from process exhaust streams at temperatures ranging from 760°C (1,400 F) to 815°C (1,500 F). 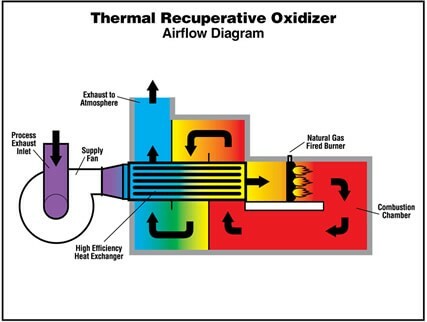 Thermal Recuperative Oxidizer’s utilize a multi-pass shell-and-tube type heat exchanger, which is fabricated of heavy-duty stainless steel. Oxidation is achieved as pollutants pass through the combustion chamber, are mixed and held at elevated temperatures in the combustion chamber. The basic design concept of thermal oxidation is to promote a chemical reaction of the air pollutant with oxygen at elevated temperatures. This reaction destroys the VOC emission in the air stream by converting it to CO2, H2O and heat. The rate of reaction is controlled by the factors of time, temperature and turbulence. 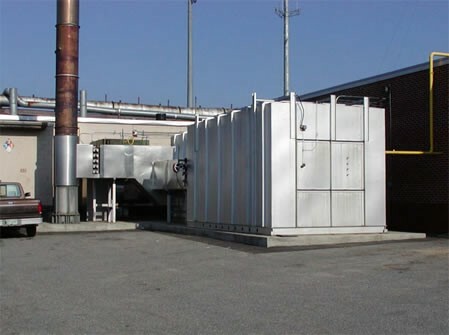 In operation, the process exhaust fumes are forced into the recuperative oxidizer inlet manifold (with a high pressure supply fan) and directed into the cold (tube) side of a high efficiency, stainless steel, multi-pass shell-and-tube type heat exchanger. The pollutant laden air passes through the combustion chamber, is thoroughly mixed for temperature uniformity (turbulence) and held at the elevated set-point temperature (temperature) for a residence time of 0.5 to 1.0 seconds (time). VOC/HAP emission control takes place within the combustion chamber where auxiliary fuel is introduced if necessary. After passing through the combustion chamber, the clean (hot) air is routed back through the hot (shell) side of the heat exchanger where it continuously preheats the incoming air. Upon exiting the heat exchanger, the clean (cooled) air is routed through an exhaust chamber and ultimately through the exhaust stack. Heat exchangers for use in standard thermal recuperative units are typically fabricated from heavy duty stainless steel. Thermal efficiencies range from 40% to 80% with expansion joints as required. To maintain low external shell temperatures and minimize radiant heat loss, the unit is internally insulated with long-life ceramic fiber modules. The external shell is made of carbon steel. Air pollutant destruction efficiencies of 99%+ can typically be guaranteed. Contact The CMM Group with questions or request a quote below and let us know how we can assist you or provide more information on our VOC destruction systems.